As a homeowner, the largest expenses you will have after you pay your mortgage payment is for energy consumption. 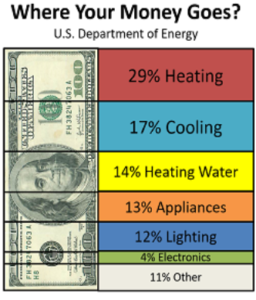 Factors that contribute to the amount you will pay are air leaks, amount of insulation, efficiency of your heating and cooling system, water heater(s) and lights. However, some of your appliances can be energy pirates when not in use. Items like TVs, computers, monitors, satellite and cable boxes, power adapters and DVRs all keep your meter spinning even when turned off and not being used. They may only consume a small amount of energy but all these things can add up to a big boost to your electric bill. By unplugging these energy pirates you will see a decrease in your energy bill but who wants to unplug and plug every day. A better solution is to plug them in a power bar with an on/off switch and just switch them off when you aren’t using them. A much easier option than unplugging and replugging. Also pay attention to electronics that have sleep modes like computers, laptops and and ipads. Put them to sleep when not in use. The Department of Energy provides an Energy Saver Guide, which you will get a copy from me if you click the link, and do-it-yourself suggestions for combating the energy pirates.